What is it about turtles? Is it that they carry their homes with them? Or that they appear to be shy and retiring? Or that they are a reasonably easy-care pet to have? Whatever it is, those interested in turtles and their habits will find much here to explore. 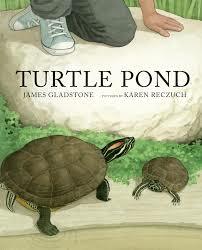 It is a book about one specific species ... the red-eared slider. It is recognizable as the one most often kept as a pet. In this journey through the seasons for a young boy and his family, readers learn a great deal about this particular turtle. They are frequent visitors to the turtle pond at the public gardens in their community. In those visits, they make careful observations concerning turtle behaviors. They climb on each other. A stack of turtles at turtle pond." The text is accessible for young readers, and informative. Each season brings new observations to be noted and recorded in clear text. For those particularly interested, this quiet book is likely to lead to further study. An author's note provides additional facts about turtles in general and this one in particular. to the vast numbers we have bred as pets." The author's fascination is clear, and the realistic graphite pencil and watercolor illustrations are rich in color and detail. 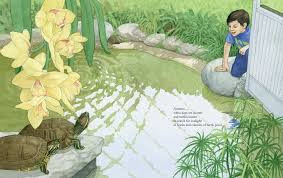 The soft colors, with bright hits of red for the turtle's 'ears', speak to the quiet calm of the pond. Changing perspectives allow further understanding for these gentle, curious and ancient creatures.